This tool creates reinforcement for rectangular slabs, openings are considered automatically by the extension. Users can choose one way or two way type from the extension dialog. Installers are available at OneWay TwoWay Slab for Tekla Structures version 2016. Click the icon ‘OneWayTwoWaySlab’ from Component Catalogue. 2) Pick two points to define the direction of the main bar. 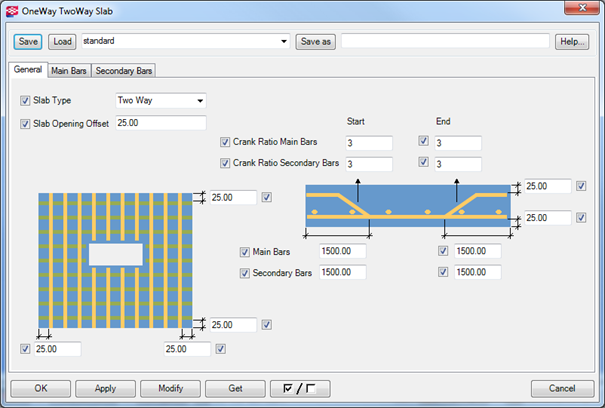 You can change the Slab type, crank properties and cover dimensions. Slab Type: You can select either 'one way' or 'Two way' slab. Crank Ratio Main Bars: You can specify crank slope ratio for main bar at start and end. Main Bars Crank Distance: You can specify the distance for crank in main bars start and end. 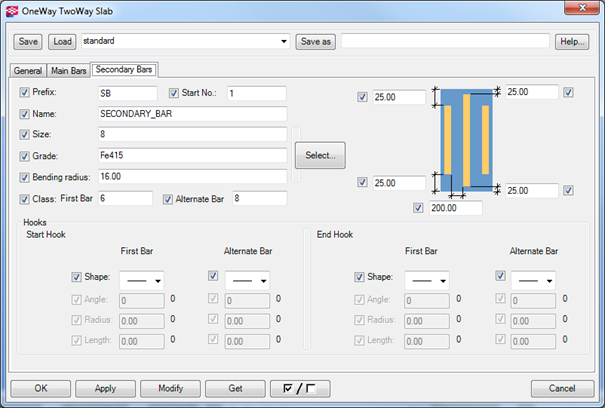 Secondary bars Crank Distance: You can specify the distance for crank in secondary bars start and end. You can change the main bar properties, spacing and bar offset.
' and different 'Hook' properties for first bar and alternate bar. You can specify rebar start and end cover for first and alternate bars individually. 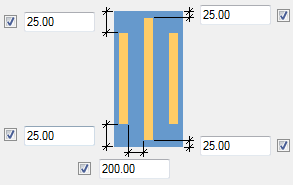 You can change the secondary bar properties, spacing and bar offset. You can provide different 'Class' and different 'Hook' properties for first bar and alternate bar. This plug-in is for rectangular slabs only. This plug-in won’t work for slabs which has chamfers.